Mitchell Starc is relishing playing with the pink ball at the Gabba. 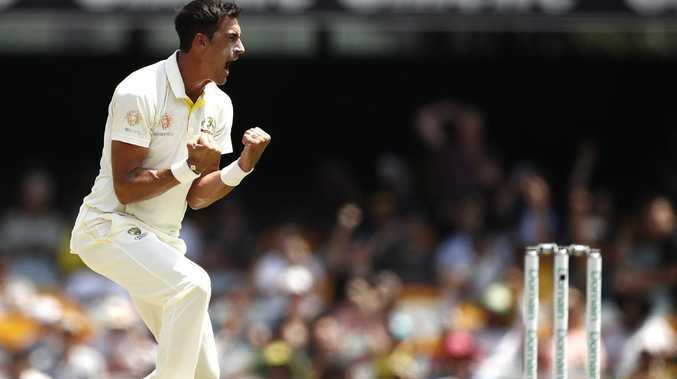 MITCHELL Starc celebrated his 200th Test wicket and the speed at which he did it shows where he stands in Australian cricket. The longer a player plays the more reliable their figures are, and Starc's entry into the 200 club in his 50th Test match has him keeping step with the likes of Brett Lee, Mitchell Johnson, Merv Hughes and Ray Lindwall. Starc has been under siege from critics this summer led by Shane Warne, but teammate Nathan Lyon has spoken out and declared the condemnation of the left-armer has been grossly unfair. Unless Starc improves in the second half of his career, greats like Dennis Lillee and Glenn McGrath might remain in a higher echelon, but even as it stands the 28-year-old is on track to go down as one of Australia's very best. Hughes and Johnson took 49 matches to reach 200, and Lee and Lindwall 51 and 52 respectively, and the history books offer some perspective for Starc's so-called summer from hell. Lyon said a fired-up Starc had been harshly treated by analysts. "To be honest with you, I don't really agree with the criticism Starcy is under," Lyon said before the Test. "To be in that position (200 Test wickets) you must be doing something right. "Mitchell Starc is an absolute x-factor, he's a great player, and he's one of the best fast bowlers in the world. Mitchell Starc is the centre of celebrations after his 200th Test wicket. "He's lethal with his action. "It's been pretty unfairly documented all the criticism of Mitchell Starc. "Bowling on the MCG and SCG wickets, they weren't really conducive to fast bowling. "I think that's in Mitch (to get fired-up) and when Mitch is bowling well I think that's part of it. "Hopefully everyone will jump off his back." Starc's celebration of 200 was rather subdued given he reached the milestone upon taking Sri Lanka's seventh wicket, when at the start of the day he thought he'd brought it up in grander style by making the first breakthrough. The umpire gave Lahiru Thirimanne his marching orders for what would have been Australia's first fast bowling lbw of the entire summer - only for the Sri Lankan to ultimately save himself on review. Starc was swarmed by teammates when the finger went up, but the party was spoilt when replays showed the ball to be just missing leg. 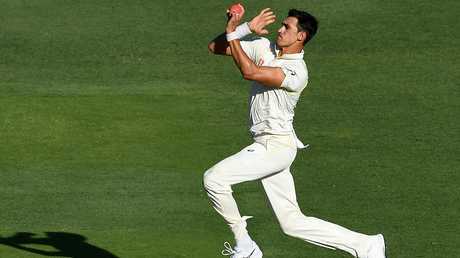 No one in world cricket possesses a better record with the pink ball than Starc and despite debutant Jhye Richardson stealing the show, the NSW spearhead still looked like he'd rediscovered some of his mojo. 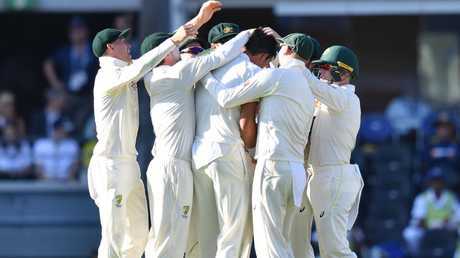 Australia have bemoaned the state of some pitches this summer and the fast and lively Gabba came as a Godsend as they desperately chase a confidence-boosting win. Nathan Lyon said criticism of Mitchell Starc’s form was unfair. "I'm very good friends with Justin Groves, who is a great curator at the SCG. I know he was disappointed with the SCG wicket," Lyon said. "The good wickets around the country are the wickets with some pace, some bounce and some movement in it as well, which creates a contest between bat and ball and I'm probably speaking on behalf of the whole of the Australian public that the games that they want to watch are the games where there is a contest between bat and ball. "That's where Adelaide and the Gabba and even Perth this year was exciting times because there was a contest."